NOTE: This is the first in a series of 31 reviews of scary short stories and novels. As part of All Hallow’s Read, I will be sharing all the scary stories that I think you should consider giving to someone for Halloween. Because this is a tradition intended for people of all ages, some of these titles will be for children and young adults, while others are meant strictly for adults. Happy Reading. Few people can actually scare me. I think there is a self defense mechanism in my brain which triggers when something comes close to penetrating my psyche and making itself at home. Every now and again though, a writer, or artist, will succeed in sneaking past my fright-guard and get their fingers deep into my subconscious. Joe Hill is absolutely one of those individuals. Some others will make an appearance later on, but I thought it fitting to begin with a fairly recent book that shouldn’t be hard to find. For those of you who don’t know, Joe Hill is short for Joseph Hill King. AKA: Son of Stephen King. Also AKA: The model for Danny Torrence in “The Shining”. I first became aware of Mr. Hill in the gone pages of Wizard Magazine just as his new comic book “Locke & Key” was being released. The concept of a house filled with locked doors that, when opened, are capable of amazing and terrifying things (such as removing your soul from your body, or opening up your head to see your thoughts) hooked my imagination. On the surface it’s easy to compare Joe with his father. They look alike. They talk alike. They love Rock & Roll, books, Richard Matheson, and scary things. They even both write about scary things, often incorporating the other things they love. Even King himself, in an interview he did for Neil Gaiman, said that their styles are so similar that if he died, Joe could keep writing under his name and no one would know the difference. He says the largest distinction between them is that Joe has the better ideas. But I’m not so sure that’s the case. 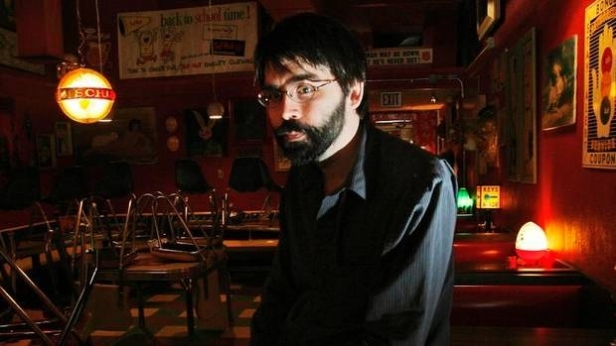 When I first read Joe Hill, I was pleasantly surprised how much not like his father he wrote. If anything his style was closer to Richard Matheson, stripped down, specific, and elegant. In his introduction to “20th Century Ghosts”, Christopher Golden almost describes Joe’s writing as participatory. He gives the reader just enough for them to complete the picture for themselves. Where I think Stephen lays it all out, often resorting to verbosity, Hill knows the right elements to touch on to keep the story flowing yet utterly engrossing. His first novel, Heart-Shaped Box, was released in 2007. It tells the story of washed up sleazy rocker Judas Coyne (think Iggy Pop and Alice Cooper) and his collection of the macabre. Over the years his twisted fans have sent him all manner of demented crap, including a witch’s confession, a used noose, and what is rumored to be an actual snuff film. He’s picked up the collecting bug and adds to it when he can. When his assistant shows him a direct invitation to purchase a haunted suit on an internet auction, he has to have it. The suit itself belonged to the seller’s father. She says that her father’s ghost is attached to the suit and will follow it anywhere. The suit arrives in a black Heart-Shaped box. Things get very bad for Judas, his young girlfriend, and his assistant pretty quickly. Turns out Coyne has a past with this ghost and it wants revenge for one of Judas’ many mistakes, one he can’t even remember. The old man who haunts the funeral suit was as sick and twisted an individual as there could ever be, and that was long before he died with his personal vendetta to kill Coyne and everyone close to him. If evil could manifest it would be as this homicidal ghost. What follows is a fast-paced, living fever dream of mind control, torture tactics, and murder, and the horror of our pasts. 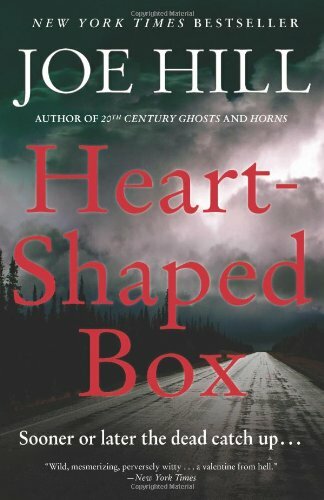 Heart-Shaped Box is a scary book with great depth. The horrors come from the constant threat of violence, the affective atmosphere, and in exploring Coyne’s Rock ‘n’ Roll lifestyle mistakes. It can be both subtle and extreme. It wasn’t the novel as a whole which I found so scary. Although it was often disturbing on many levels. The idea of everything being for sale on the internet is scary, and true, but not quite enough to get to me. His depiction of ghosts as having black lines over their eyes, as if someone had scribbled them out with a black marker, was sufficiently unsettling. But there are two scenes in particular, two almost inconsequential scenes, that drove into straight into the place where childhood nightmares wait.